It was a frustrating day for both Padraig Harrington and Paul Dunne as the pair failed to get airborne on day two of the Turkish Airlines Open. After a blistering start yesterday, Harrington laboured to keep pace today, struggling to mesh all facets of his game into one cohesive unit as he signed for a frustrating one over par 72. Dunne was slightly better in his execution but was heading straight for the range regardless after a one under par 70 left him on the same score as Harrington for the tournament, the pair sharing a tie for 13th at five under par. For Padraig, it was just one of those days where the course won the battle – his miraculous short game skills getting him to the turn in a hardly believable 33 strokes. Then as his long game returned, his short game abandoned him, the cruel mistress that is golf rearing her ugly head once more. “I started a bit ropey but the short game was good, then I started to play well and my short game was terrible. These things happen: the two bogeys at 12 and 13, another day you’d make two birdies and I’d be nine under and happy, it’s just the way the day goes. Long known for his scrambling abilities, Harrington made an outrageous up and down for par on 2 when for all the world it looked like he’d make bogey at best. It was a hopeless position at the foot of an enormous tree, playing from the pesky pines – a shot of a lifetime for some, just another day in the office for the three time Major champion however. Three bogeys over four holes on his back nine were his undoing, a particularly bad slice of luck coming when the angle of the sun on 13 reflecting off his new club rendered him near blind playing his third shot. Padraig’s down but not out, though he might leave the shiny wedge in the hotel room tomorrow nonetheless. On what’s needed for the next 36, Harrington has the elements, he just needs to put them together. Greystones golfer Dunne came off the course in much better spirits despite losing ground on the leaders after his round of 70. It was a mixed bag for Dunne, who birdied both his first and last holes, with two more gains coming at 7 and 13 along with three dropped shots. Still, by his own admission his golf game is a long way off perfect this week and he’s just happy to be heading to the weekend with a chance despite the way he’s hitting it. “I’m quite pleased considering how badly I’ve played over the first two days, to be still in with some chance is quite pleasing. I have a lot of work to do on my long game. I’ll probably be the last man off the range every night this week if it keeps feeling like this. “The club’s just getting really steep on the way back. It’s one of those things where I can get it right on the range if I do it really slowly but I’m struggling to find the confidence to bring that to the course. Burly Belgian Nicolas Colsaerts is the man they all have to catch after he posted his second consecutive round of 64 to open up a four shot lead at the halfway mark in Turkey – the sixth tournament out of eight in the European Tour’s Rolex Series. After starting the day in a three-way share of the lead, Colsaerts quickly pulled clear of the field on the front nine, picking up four shots in his opening six holes. 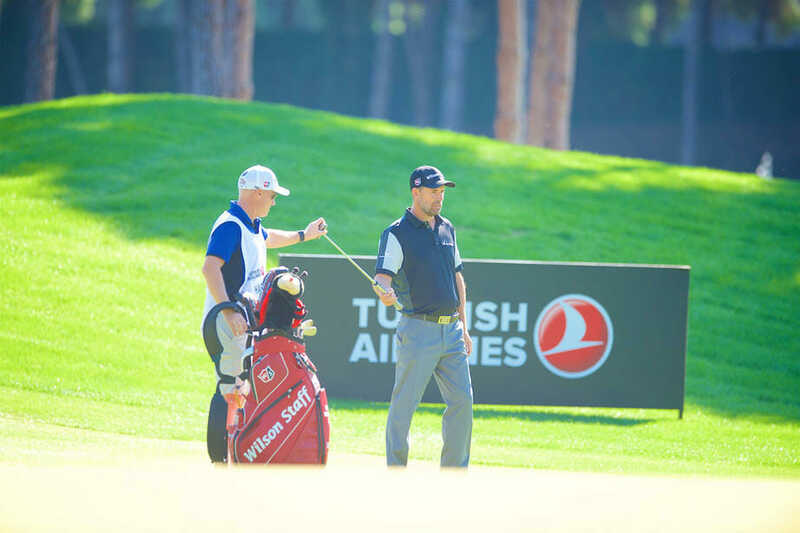 He added further birdies on the 11th, 12th and 15th holes after the turn to move to 14 under par for the tournament at Regnum Carya Golf & Spa Resort in Antalya. Colsaerts, who is currently 49th in the Race to Dubai, has saved some of his best performances of the 2017 season for the Rolex Series events, finishing tied third in the BMW PGA Championship, tied 19th in the Aberdeen Asset Management Scottish Open and, most recently, tied 15th in the Italian Open. He will now be hoping to convert that form into a third European Tour title and a first victory since the 2012 Volvo World Match Play Championship, with Englishman Eddie Pepperell his nearest rival on ten under par after a bogey free second round of 66. “I kind of had to work a little bit for this one,” reflected the Belgian. “Yesterday was kind of eyes closed and everything kind of falling on my lap. Today it’s more satisfying to shoot the same score but having to go and find it a little bit more. “If I’m capable of going 14 under in two rounds, then somebody else or a few other guys are capable of doing the same. I was kind of playing aggressively, sensibly enough, to still give myself birdie putts, because I have the pace of the greens since yesterday morning and that seemed to be fine. Behind him, Pepperell is enjoying a superb run of form, having recorded five top ten finishes in his last six appearances, and he will be seeking a maiden European Tour triumph this weekend. Another in-form player, Thailand’s Kiradech Aphibarnrat, is third after moving to nine under par courtesy of a round of 67, while Ryder Cup players Matthew Fitzpatrick and Stephen Gallacher are a further shot back after rounds of 65. They share fourth place with England’s Matthew Southgate (65) and Lowry (66).